Our "Elle" is a dainty flower that has a cluster of sassy sequins in the center and one sequin on each of the five center petals. 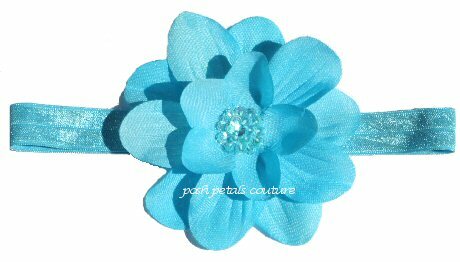 It measures approx 2 inches and is fastened to an elastic headband. Our elastic headbands are 5/8 inches wide. They keep their elasticity and are soft and silky to the touch. 2 inches and is fastened to an elastic headband. Our elastic headbands are 5/8 inches wide. They keep their elasticity and are soft and silky to the touch. approx 2 inches and is fastened to an elastic headband. Our elastic headbands are 5/8 inches wide. They keep their elasticity and are soft and silky to the touch. 5/8 inches wide. They keep their elasticity and are soft and silky to the touch. Our "Anniston" flower has a collage of brilliant sassy sequins in the center. It measures approx 4 inches and is fastened to an elastic headband. Our elastic headbands are 5/8 inches wide. They keep their elasticity and are soft and silky to the touch.